IN his continuing search for the more weird, wacky and wondrous in the world of travel, David Ellis says that a survey in England has found that a whopping majority of those who took part would like to see adults-only cabins on long-haul aircraft flights. Accommodation website HolidayExtras.com asked 5000 of its customers just what they wanted in air travel, and flights sans enfants came out tops: 83 per cent of respondents said they'd like to see adult-only cabins, and a third of those went even further saying they'd like to enjoy select flights on which children were totally banned. None. Nil. Zilch. And as could be expected another gripe was leg room: more than 75% of those polled said they needed more space, with the discomfort of being jammed in cramped spaces their worst nightmare whilst flying. HolidayExtras.com Product Innovation and Merchandising manager, Anthony Clarke-Cowell said he was surprised so many travellers expressed such a strong desire for adult-only flights. 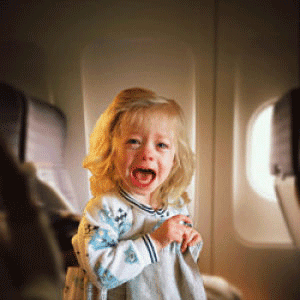 "Long-haul flights always present a challenge for families, and this is reflected in the results. (We found) that there is clearly a need for more facilities to keep children happily engaged in quieter pastimes – and not only during a flight, but in preparation before their flight as well," he said.